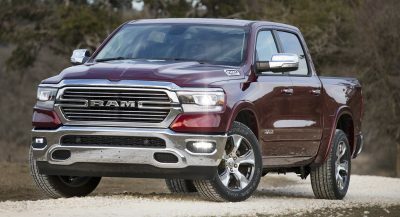 Although Toyota may have officially lost its crown as the world’s biggest automaker by sales, Google search results reveal that it is by far the most searched car brand in the world. 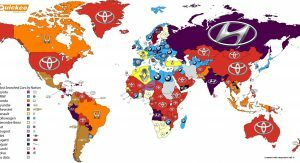 In data collated by Quickco, it is revealed that Toyota was the most searched car brand in no less than 74 countries last year. 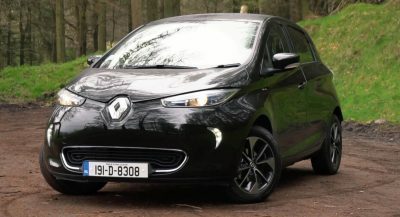 The Japanese automaker topped the searches in countries including the United States, Australia, China, Greenland and the vast majority of central African countries. 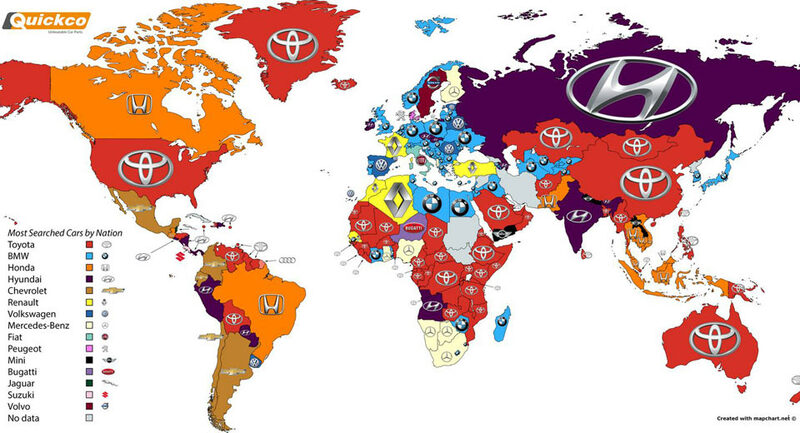 Behind Toyota was BMW where it was the most searched in 51 countries. Unsurprisingly, many of these nations came from Europe and included Germany, Belgium, Poland, Austria, Croatia, Ukraine and Norway. Coming home in third was Hyundai with the Korean company proving particularly popular in Russia and India. Honda was also popular, especially throughout Indonesia, Canada and Brazil. 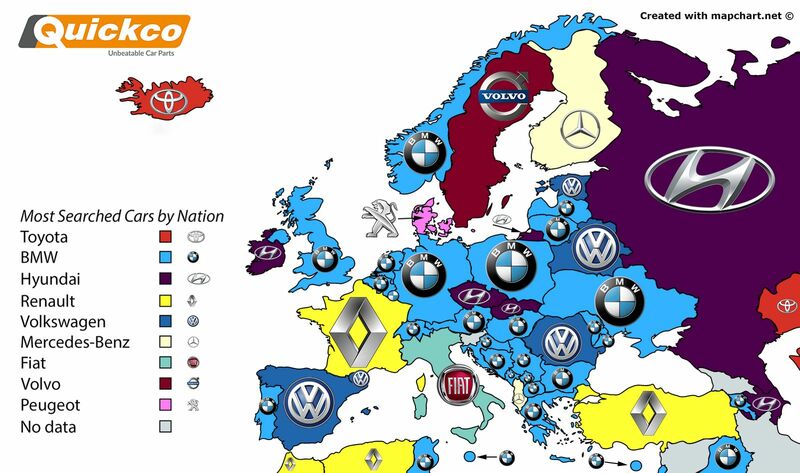 Other interesting takeaways from the results show that in Sweden, Volvo was the most searched brand while Fiat appropriately took home top honors in Italy. Despite being the world’s largest automaker, Volkswagen only topped the results in Spain, Romania, Belarus, Estonia, Cape Verde, Andorra and Uruguay. Put Italy on account, too. Apparently, Costa Rica likes Suzuki a lot. As can be seen when visiting the local website, Suzuki got there a broad lineup covering a lot of segments from regular cars (sedans and hatchbacks), SUVs (specially those with true off-road capacity like Grand Vitara and Jimny, when considering how forested is that Central American nation) and commercial vehicles. 11) I’m still trying to understand why Mini leads in such diverse countries like Yemen, Nepal and Laos. The strange appearance of Mini in such an underdeveloped country as Laos makes me suspect it’s a mistake in the method. For example, how do they filter out other meanings of “mini”? Surely the strategists from every brand are considering this map when it comes to make its products more known in the world. You commented so I’ll go with…you. 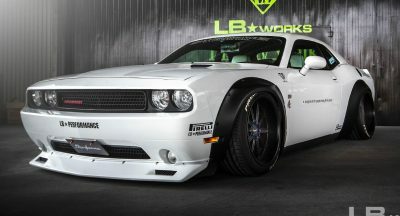 What, no Chrysler or Dodge??? I know…not very nice. 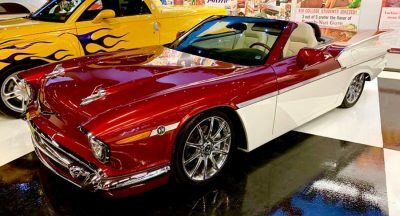 No Ford and no Jeep, either which is interesting since Ford is Britain’s best seller and Americans love the F150. And those Japanese and their BMWs! true, actually reports say (and I read it in CarScoops) that VW (golf) outsell Volvo in Sweden last year..
Toyota is invading the globe yet its pretty much strange to me that Japans most searched car brand is not a Toyota though!! OK, that’s great. 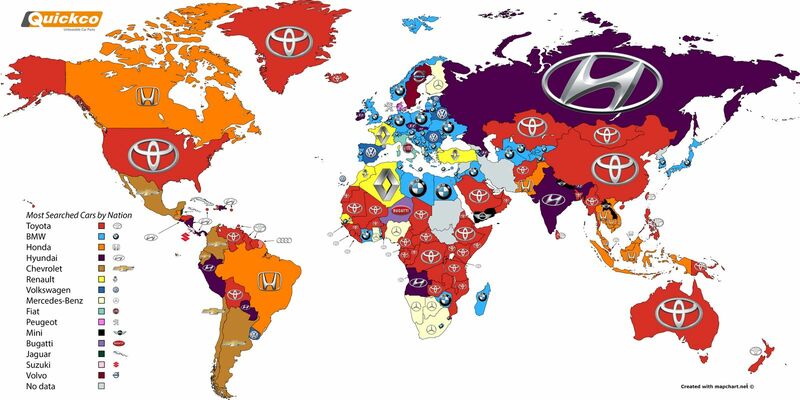 Now show me the #2 most Googled car brand in every country. How about the top 5? I would be happy with being top 5 in most countries. China doesn’t even have google …. Geez the world is a boring place. Toyota? Yawn. 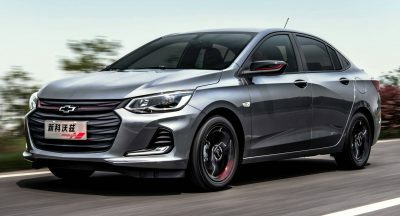 Hyundai? Yawn. 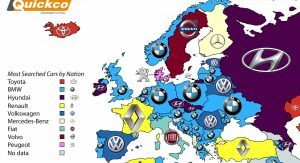 South Africans love their German brands, I’m surprised there’s no VW there.